The third photo purchased from Roger LeRoque, a local collectibles dealer, of rare Boyle Heights images is this one of a cafe, identified as Fleishmans, located on Brooklyn (now César Chávez) Avenue at Soto Street. This simple place has about fifteen stools along an L-shaped counter and a very compact cooking space. Three employees, two men and a woman, are behind the counter, with the young man at the far right appearing to be Latino. A fourth man, wearing glasses, stands behind the glass cabinet behind the tall employee at the left. A sign hanging over head indicates a "Quality Lunch" or that the restaurant may have been called "Quality Lunch Cafe." A man and a woman sit on bar stools, as if they were customers, though there don't appear to be any place settings, tableware or glassware set up in the places. But, the young woman behind the grill and griddle appears to be cooking up a pancake to put on the plate conspicuously raised in her left hand. The tall man has a pie tin in his left hand and what appears to be a bill-like piece of paper in his left. As far as equipment, next to the griddle and grill is a warmer. In the back are shelves with stacked saucers and plates and the like, as well as a coffee maker, sink, cash register and the cabinet with glassware and other items in it. Signs at the upper part of the back wall include one with dinner items, such as steaks and fried chicken for 25 cents, 40 cents for a small porterhouse steak, and pork chops for 30 cents--these came with potatoes, roll and butter. 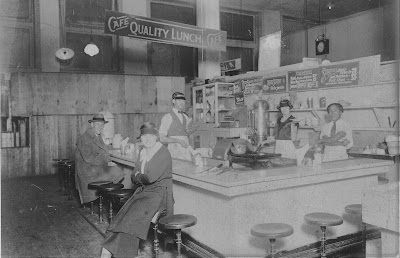 The lunch menu included ham or roast beef, with beans or potatoes, for a quarter and three kinds of sandwiches for ten cents. A slice of pie cost the same. For breakfast, the sign's tough to make out, but pancakes and omelettes were on offer, the former for 10 cents. A small sign also says meat balls and the price of 30 cents, and it is assumed that meant spaghetti and meat balls. Behind the cafe set up is an area with a clock and at least two partially hidden signs, with one having a finger pointing down as if to a basement and the words "To" and "Mill" on it. The other sign has the word "Information" on it. This circa 1920s real photo postcard is labeled on the reverse, "Fleishman's Cafe / Brroklyn Ave at Soto / Boyle Heights / Los Angeles" and is from the Workman and Temple Family Homestead Museum collection. As to the owners, the 1930 census does list a Joe Fleishman as a restaurant owner living at 2727 Winter Street, six blocks north of César Chávez and one block east of Mott, which is two blocks east of Soto, but the Los Angeles City Directory of that year shows Joseph Fleishman owning a restaurant at 218 E. 6th Street in downtown east of Los Angeles Street. Perhaps he had two places? The 50-year old native of Russia rented his house and lived there with his Sarah Kidder, and two sons, David and Jack. David's profession was listed as waiter, so that may well be the tall man behind the counter in the photo. Joseph immigrated to the United States in 1895 and his wife in 1900--both spoke Yiddish as their first language. The two sons, 23 and 22, were born in Massachusetts. The family, however, moved around quite a bit. Not long after Joseph and Sarah came to America and had these two sons in Massachusetts, they headed west. In 1910, the family was in Barthold, South Dakota, a rural area northeast of Rapid City and Joseph was listed as a farmer, with the two boys listed as Israel David and Jacob. A decade later, the Fleishmans lived in Minneapolis, Minnesota, where Joseph was listed as an egg candler (which was someone who tested eggs for quality) and the couple had two younger sons, Carl, 8, born in South Dakota, and Edward, 6, born n Minnesota. This information pegs their move to the Twin Cities to be about 1913 or so. It is not known why the two younger Fleishman sons were not with their family in the 1930 census. During that decade the family moved to Venice and Joseph and Sarah were divorced by the next census, in 1940, which showed her living with three of the sons, Jack, Carl, and Edward in that location. Joseph's whereabouts were unknown, but a 1939 Los Angeles City Directory listing had someone by that name living at 815 Blades Street, just a couple of blocks from where the family resided in 1930. In any case, the photo is an interesting one and it does not appear the Fleishmans stayed in the restaurant game, which is a tough business, for very long. Check back for more photos from this group soon. Contribution by Paul R. Spitzzeri, Museum Director, Workman and Temple Family Homestead Museum, City of Industry, from which the photo came.